Here is a sampling of some of the other albums that could have easily been included in this thesis. This is what happens when a brass band styled after Herb Albert and the Tijuana Brass are walking around the lower east side of New York City. 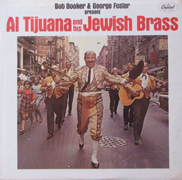 Lou Jacobi provides the voice of Al Tijuana, and can be seen on the cover. The musicians remain anonymous, though Artie Butler is listed as providing the music direction and arrangements to the writings of Bob Booker and George Foster. Booker and Foster were a pair of comedy writers that wrote such albums as The First Family and You Don't Have to Be Jewish. Artie Bulter is a pianist, composer, arranger and conductor who worked on such hits as, The Drifters’ “On Broadway”, Barry Manilow’s “Copacabana” and Louis Armstrong’s “What A Wonderful World”. The album gets a little hokey after a while without enough diversity in content, but that is a common problem for these types of albums especially when they have a substantial amount of genre parody content. The music is not particularly Jewish, most of the tunes are pop tunes. Their Jewish content is provided by the narration and the occasional toss in of the rhythm section playing two bars of freylakh between choruses or a fiddle playing a Jewish figure. 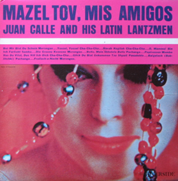 Mazel Tov, Mis Amigos (Riverside RLP 7510 from 1961) should have been included in this study, though the author was unable to acquire a copy in time for publicaiton in this study. The personnel alone make this album interesting. John Cali is the banjo (listed as lute) player and arranger is joined by: Charlie Palmieri, piano; Willie Rodiguez, timbales; Ray Barretto, conga and bongos; Clark Terry, Lou Oles and Doc Cheatham, trumpets; Wendell Marshall, bass; Shelly Russell, flute, clarinet, and bass clarinet. Eight of the eleven tracks also have vocals by Ed Powell. Aside from “Hava Nagilah”, the rest of the of the repertoire is from the Yiddish theatre except for one original by the reed player Shelly Russell. Again, like the other Latin albums, it has the feeling of being in a night club. Except for the crowd noise, one could be listening to an album like Tito Puente’s “Live at Grossinger’s”. The selection of tunes is maybe a bit more Jewish in content, but the performances are pretty straight ahead Latin. Especially given the lineup, none of the performances on the record really stand out. As the liner notes say, it is both an enjoyable record to listen to and one that is also danceable. Ed Powell’s vocals detract from the album, his singing is lacking dynamics, and does not feel like it is happening in the same nightclub with the rest of the band. 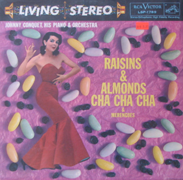 Only two of the musicians on this album are known, the pianist Johnny Conquet and the featured clarinetist Sammy Musiker. The rest of the members of the big band are unknown. What this album does have going for it, in addition to quite good music, is its wild cover and some of the best song names. The back cover (not pictured) is a cartoon with signs that you would see on the way to the fictional Merengue Manor hotel telling you about the activities. Examples of the tune names include: “Mambo a Bisel” (Mambo a little bit), “Meanwhile Back at the Harem”, and “Matzoh Ball Merengue”. The music is good, but how many places even in 1958, could have a twenty+ piece Jewish/Latin big band to play the music? The orchestration has full complements of reeds, trombones, and trumpets, plus the rhythm section has at least 4 percussionists. The orchestration really stands out on this album. An example is the track “Mambo a Bisel” with multiple reed players on flute playing a section of the melody, that is then followed by the brass section playing a shout chorus, before the piano takes over and the brass stay in to play background hits. The musicianship is also quite superb, and it may be the best of any album discussed here. It is a shame that the musicians on this album have gone down in history to this point unknown. 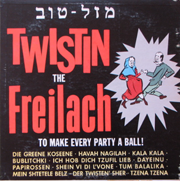 Overall, Bei Mir Twist Du Schön is slightly stronger than Twistin the Freilach. They both take the rhythm of the Twist, as popularized by Chubby Checker (who recorded a twist version of “Hava Nagila”), and play Jewish tunes over it. An example of the musical issues that mar these albums is a clarinet solo sounding too Jewish next to a sax solo that is totally in the twist style. These albums very quickly show that one needs to solo in the new style, not the ethnic style from which one is coming. 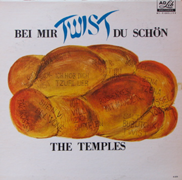 Between the two albums, Bei Mir Twist Du Schön is the more cohesive album, though the back cover of Twistin the Freilach tells us more about the creation of the album. Whereas on Bei Mir the only credit is given to the the record label A&R head Siravo, Twistin notes that that it was recorded at Bell Sound Studios in New York City. The instrumentation reads like a pop session of the time: two basses (one Fender, one acoustic), piano, accordion, drums, guitar, tenor sax, alto sax, and clarinet for Jewish flavor. Even the song selection between the two albums is nearly identical, but the arrangements on Bei Mir are just slightly better and allow for more space for the musicians to solo. These solos are important, as they show that the ones that will stand out as being bad are the ones that are not in the new style of music being playing, but instead return to the old style. If playing a Jewish twist, you should solo as if playing a twist, not as if playing the Jewish tune. An example is the tenor sax player who is listed on the LP as Sam Taran, that is the name of mobster who was thought to have been the juke box king of Florida. A second example is the alto sax player is listed as Al Sherman, who was a tin pan alley song writer and the father of the song writers Robert and Richard Sherman.